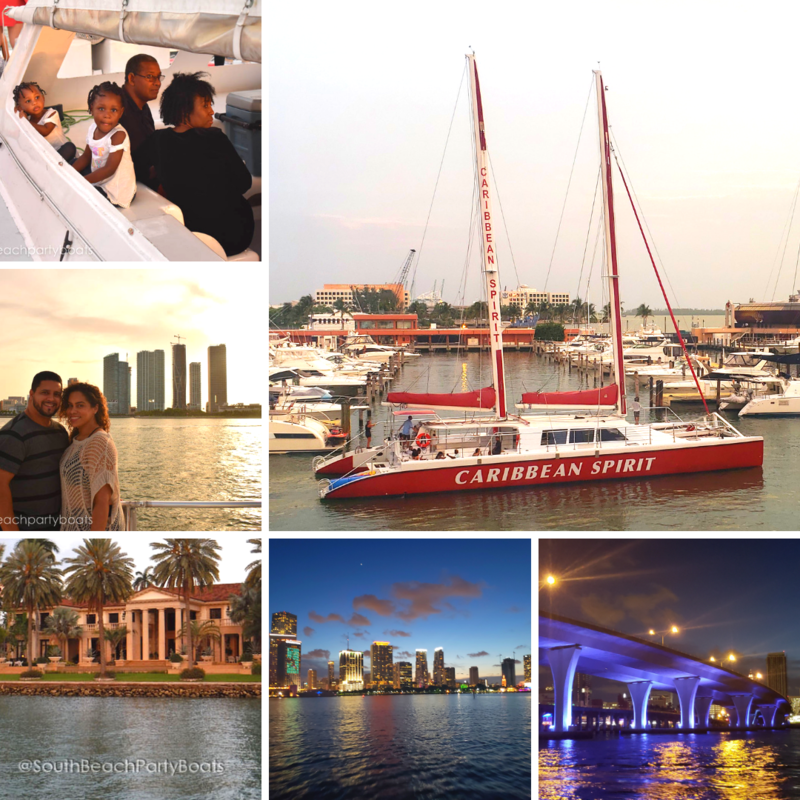 Join South Beach Party Boats for fun things to do in key Biscayne like a Sunset Champagne Cruise. This way you’ll enjoy a relaxing view of the scenic coast of Downtown Miami. The cruise departs from the festive Bayside Marketplace. On the trip, you’ll experience what it’s like to truly lay back, ride the waves, and spend quality time with the family. As the sun sets, complimentary champagne is served while you snap photos of the skyline; Unlimited snacks such as pretzels, peanuts, and soda are provided for everyone to enjoy, as well as an open bar for $3 beer and wine. This is the best place for Miami skyline photos. We sail from Bayside Market Place in Downtown Miami, past the Cruise Ports of Miami, and out to Governors Cut. Enjoy a Complementary Glass of Champagne as you sail past the beautiful sights as you sail out into the Atlantic Ocean. Enjoy one complementary glass of Champagne as you sail from Bayside Market Place in Downtown Miami Cruise past the Ports and into the Bay at Key Biscayne. We sail from Downtown Miami, past Key Biscayne, around the beautiful houses along Millionaires’ Row, and then through the world-famous South Beach Art Deco Area. What Do You Charge For On Board? All beverages and snacks are complimentary on this trip. May We Bring Our Lunch? No, additional meals or drinks are not allowed on this trip; however appetizers and beverages are provided. We take up to 125 people per trip. Yes we provide life jackets beneath the seats on deck. How Far Is It From South Beach? We are about a 15 minute drive from South Beach in Downtown Miami. When Will We Get Picked Up? Your transportation will arrive about 1 hour before your scheduled departure. The Sunset Sail appeals more to those 18 and over. Directly behind the Hard Rock Cafe Bayside Marketplace in Downtown Miami. Yes, Bayside offers ample parking, both in a nearby garage and in an open lot. Beverages and appetizers are included; it is recommended that you bring a camera. Yes. You can pay your balance at dock but we ask that you let us know in advance that you are coming. Check-in starts 1 hour before your trip. Key Biscayne Sunset Sail and Champagne Toast vs. The biggest difference between the Star Island Sunset Sail and the Key Biscayne Sunset Sail is that the Star Island includes complimentary beer and wine as a Miami booze cruise. The Star Island Sunset Sail is a Booze cruise with complimentary beer and wine. 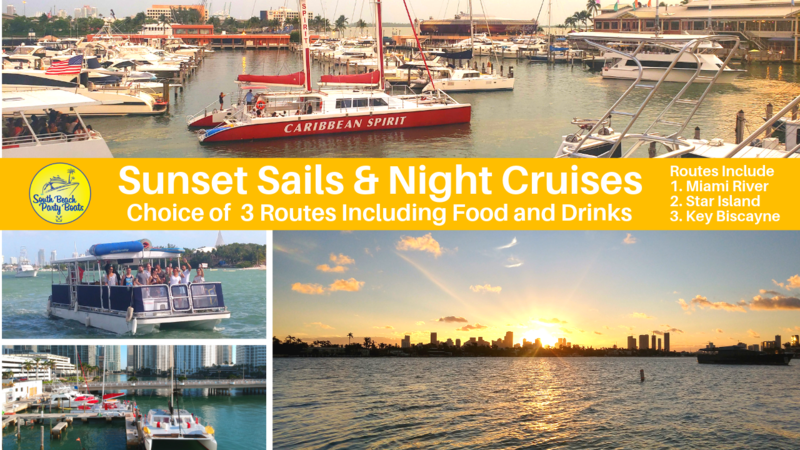 The Key Biscayne Sunset Sail offers one complimentary glass of champagne per person at sundown and $3 Beer and $4 Wine are available for purchase for the duration. All-Ages Ages 18 and up Yes. Parents/Guardian responsible for providing life jacket to children weighing less than 30 lbs. *Departure time may vary please check email conformation for final time. If time changes after booking, we will call text and email. If we need to change time due to unforeseen circumstances, we will offer refund if necessary. For your safety and enjoyment, we offer sailing catamarans with licensed captains, two giant nets and a comfortable front sun deck. The cabin has seating for 125 passengers along with a bar offering drinks and refreshments. The vessel comes equipped with a sound system, bar, coolers, and ice. The hull is equipped with a dry luggage storage area, as well as a full- size bathroom with marine grade toilets and running water. May We Bring Our Dinner? No, additional meals or drinks are not allowed on this trip; However, appetizers and beverages are provided. Yes we provide life jackets beneath the seats on deck. Parents/Guardians of children under 30 lbs are responsible for child/infant life jackets. We are about a 15-minute drive from South Beach in Downtown Miami. For your safety and enjoyment we offer sailing catamarans with licensed captains, two giant nets and a comfortable front sun deck. The cabin has seating for 125 passengers along with a bar offering drinks and refreshments. The vessel comes equipped with a sound system, bar, coolers, and ice. The hull is equipped with a dry luggage storage area, as well as a full size bathroom with marine grade toilets and running water. Call 7865297787 to order food. As the sun begins to set, our great sails come out on the Key Biscayne Sunset Sail, where you’ll celebrate a great Miami vacation Memory in a calm, relaxing way. Family, friends, and food are enjoyed while you overlook the horizon, take photos of the beautiful sunset, and a citywide view of the Downtown Miami Skyline plus take in special views of Stiltsville in National Biscayne Park on the edge of Biscayne Bay. Cruise past the Biscayne Bay Aquatic Preserve and the endless ocean. The sky lights up as you give a toast to another amazing year and get ready for your Night start with champagne and a toast to the good life on the water. View the beautiful Miami scenery, cruise into the distance, watch the old day fade away as the evening welcomes itself. Check the schedule for confirmed availability and departure times, check-in is 30 minutes prior to departure time. The boat leaves promptly at set departure time. Enjoy Miami as you’ve never seen it before! Listen to some music and sip champagne as you relax in the nets or watch from the cabin. We offer $3 Beer and Wine as well as with complementary soft drinks and appetizers during the Trip. As the sunsets, the skyline turns on and we enjoy the beauty of the bay. The entire trip, you are able to move freely around the boat, walk around the decks and find the perfect picture backdrop. Sail into the night, relax to the motion of the ocean, and watch the as lights illuminate the night. Experience Rated TOP 5 on Trip Advisor!